These are blocks for my Naked Bed Challenge quilt. They are mostly about 17" square or a little larger. The plan for my (king size!) quilt was originally going to be 16 blocks, 16" square each, separated by sashing and surrounded by wide borders. 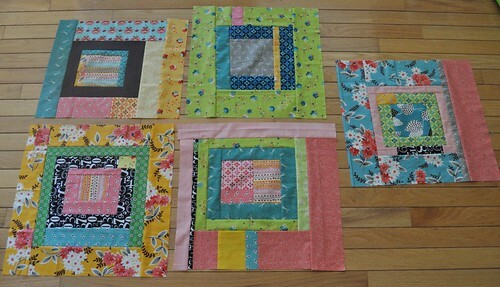 I'm using my Flea Market Fancy fabric for the blocks, and the sashing/borders will be gray. I decided not to trim the blocks down to 16.5" though, that would be a waste of half inch (or more) strips of fabric here and there and I think in the end I will figure out a way to keep them all slightly different but still fit together well in the quilt top. I was feeling frustrated a few times throughout the week, wishing I was getting more done, but we are finishing up the school year and it's a busy time. I was able to go and spend time with my boys at school, and also attend the promotion ceremony for my 5th grader who will be moving down the street (for school) to the middle school in the fall. Also, these blocks are somewhat time consuming. I try to put a lot of thought into the color and value placement while making each block, and then it usually takes some time to get the layout of the quilt top just right as well. I had a twitter friend who said something about just pulling fabric and sewing the blocks randomly, and I actually think that would be a good exercise, but it hasn't been how I've made this style of block, so far at least. Have you made improvised log cabins or done other improvisational quilting? What is your process like? So even though I was discouraged this week, and feeling like these were coming along slowly (and I might not make the June 2 deadline for a finished quilt top), I got almost 1/3 of the blocks I'll need finished. I am going to see if I can get another one done tonight, but I might need to play some video games with my kids. I'm just going to keep at it and if I don't make the deadline, it will be ok. I echo your frustrations. I have a 7mn and 3yr - and neither one is all that happy when I want to work in my sewing studio. And they won't nap at the same time. My stash and ideas are piling while my time is quickly shrinking. When I get really frustrated, I remind myself that before I know it, I will have all the time in the world to work and will only want to hold my babies. Good advice from Jennifer R. I also want to say, didn't you join this challenge for fun? 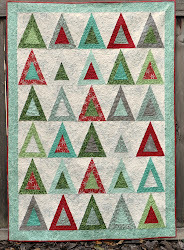 If it isn't fun and is adding stress to your life, keep working on your quilt at your own pace and enjoy it. It was just a fun thing you wanted to try. It might not work out this time. A) These blocks are LOVELY! and B) This is a whole different ball of wax from sewing up a big stack of quilt blocks all made from the same shapes. Don't get discouraged, instead rejoice in your growing skill as a quilter - you're making something unique, rather than re-creating a pattern! I so feel your pain...I joined a quiltalong a few months back and was discouraged that I couldn't keep up...life just keep getting in the way. But my quilt top is done, and I'm very proud...hopefully quilting it won't take so long! You asked about how others make improv log cabins. I also have felt that maybe I was putting too much effort into fabric placement, which fabrics to use, etc. I made a baby quilt with wonky log cabins with fussy cut centers, and got so tired of making them that I stopped at 5 and made the alternate blocks as wonky 9-patches instead. I made each block individually, which meant even though I started with a pile of strips/scraps, I got up from the sewing machine after each seam, pressed it and cut the next side straight, and then often had to cut a strip or scrap to use as the next piece. That was time consuming and tiring. Recently I found a bunch of odd scraps from old 4-H workshops I taught, and wanted to use them as the centers of wonky log cabins. This time I allowed myself to be much more random. FIrst I fussy cut the center pieces. Then I chose all the strips and scraps that were the colors I wanted to use. Then I started sewing them chain style, by sewing a piece on the right of each center. I had 15 center pieces, so I didn't have to stop to press and trim until I had 15 sides on. I kept adding more pieces in the same way, pressing and trimming after 15 seams. I purposely chose the shorter scraps and strips for the first rounds, leaving the longer ones for the end. And I did try to select fabrics to contrast with the previous piece on that block, such as using a green print after brown or red, etc., so one block wouldn't be too monotone. Even though it felt really random as I worked, it was fast and fun! The blocks are coming out great. I am adding a last round of beige with white dots. After that I may put sashing between the blocks - not sure yet. I am going to put them on my blog tonight. Thanks for sharing your pretty blocks. I do like them very much. Your nine-patch is beautiful, too, and so are your kids! Don't put stress in you life. Kids come first. Your blocks look GREAT and with that special fabric, you will want to take your time and do it the way you want it. Thanks everyone! I didn't want to come across as complaining, I did end on Friday being satisfied with my week and have had a good day today too. I do try to balance my family and friends with my sewing and blogging and I feel better when I do a bit of housekeeping along with my sewing. I make my blocks 2 at a time (so as not to have thread ends to deal with) and often sew 2 opposite sides of a block at a time instead of doing it "true" log cabin style. So my 6th block is started, I worked on it while I finished #5. I am having fun with it and I think focusing on just one project (with maybe a couple small things that can be finished in <1 hour) will be a good approach, especially for this project and this challenge!